You are here: Home / Recipes / Use Cranberry Sauce Leftovers in This Easy Sandwich Recipe! 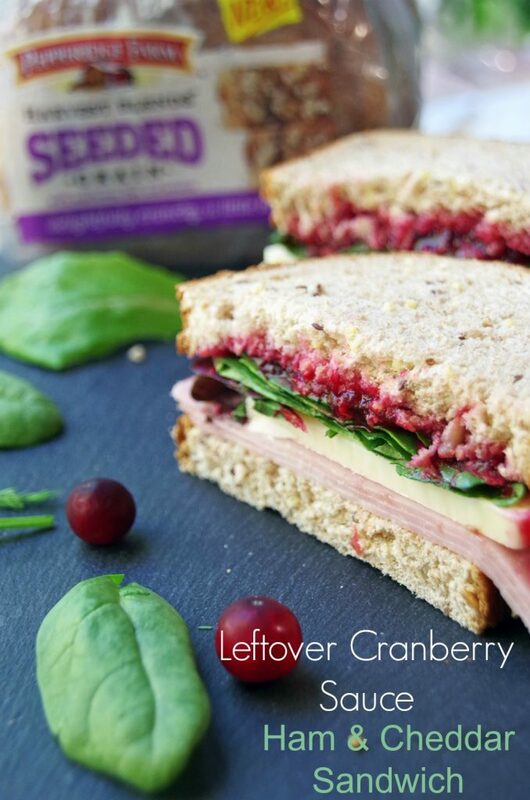 Use Cranberry Sauce Leftovers in This Easy Sandwich Recipe! This cranberry sauce leftovers recipe has been sponsored by Pepperidge Farm® but all opinions expressed here are my own. There are certain foods that I grew up on that I have come to realize were not all that delicious. Canned cranberry sauce is one of them. My mom was a great cook but for some reason, we ALWAYS used canned cranberry sauce rather than homemade. When I got out on my own after college, I decided to try my hand at making it from scratch. It was beyond delicious and every year I make a double batch because I could eat cranberry sauce leftovers for DAYS and be perfectly happy. Of course, I love them straight out of the bowl but I also enjoy finding creative ways to use that leftover cranberry sauce in other dishes. Sandwiches are one way that I love to eat homemade cranberry sauce so when I was asked to partner with Pepperidge Farm Harvest BlendsTM bread, I knew this would be a delicious way to use up some leftover cranberry sauce. Of course, the type of bread you choose for your cranberry sauce leftovers sandwich is key! Pepperidge Farm Harvest Blends breads contain special blends of whole grains and seeds that deliver a new and unique eating experience. 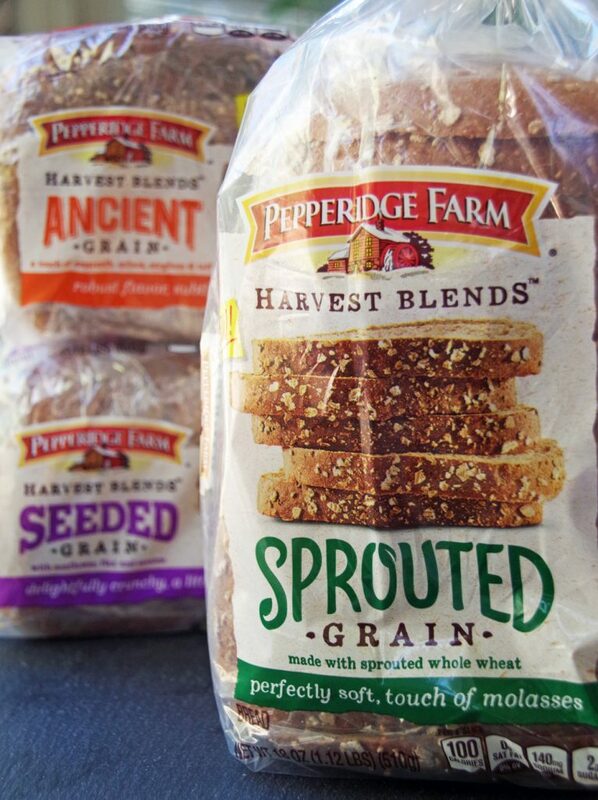 You can choose from Pepperidge Farm Harvest Grains Spouted Grain Bread, Harvest Grains Seeded Grain Bread, or Harvest Grains Ancient Grains Bread. Having tried them all out this weekend, I can tell you that I really enjoyed the softness of the bread combined with the bits of grain and seeds. Now, you already have the delicious cranberry sauce, right? Well, skip the plain old boring American cheese and use a good, sharp cheddar. If you cooked a ham for the holidays, by all means, use slices of fresh ham. If you don’t have fresh ham sitting around you can use sandwich meat from the deli like I did. Of course, you could also pair leftover turkey with this easy sandwich recipe but personally I like the combination of ham and cheddar much more! I must admit, I loaded up my sandwich with as much leftover cranberry sauce as that bread would hold! Doesn’t this look delicious? 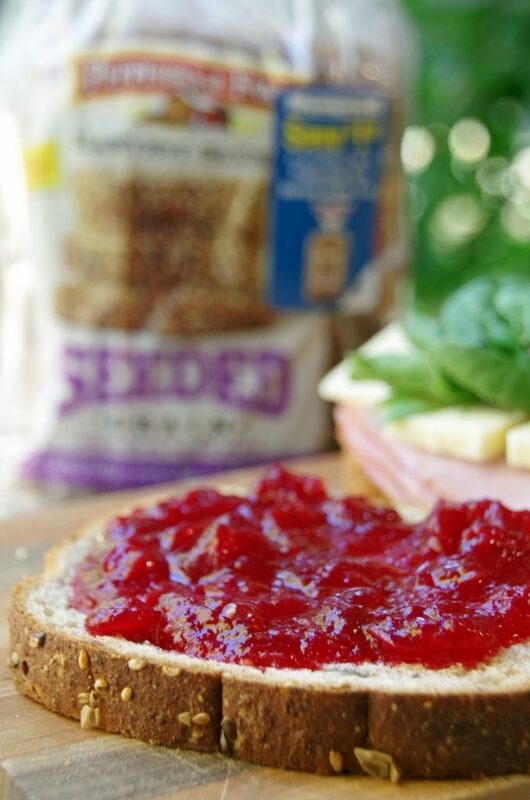 Make sure you pick up some Pepperidge Farm Harvest Blends bread for your leftover cranberry sauce sandwiches! If you want to learn more about this bread or follow the brand on social media, check out the following links! Use Cranberry Sauce Leftovers in This Easy Sandwich Recipe! A delicious ham sandwich recipe the uses up a few of those holiday leftovers! Love this sandwich recipe? Pin it for later! Cranberry sauce was one of those holiday dishes that I went years without trying. What a mistake! Now I love it, and having it with a yummy sandwich sounds perfect. Ahhh... I love cranberry sauce and bread chalk full of seeds and other good ingredients. Your sandwich looks incredibly delicious! I've never been a big cranberry sauce fan, but I think this looks delicious. Since it's not straight cranberry sauce, this is much more doable for me. This looks amazing!!! We had so much cranberry sauce and turkey left over after Thanksgiving, this would have been great for lunches! I have a fantastic cranberry sauce recipe that we make extra for. Just to use it on sandwiches! 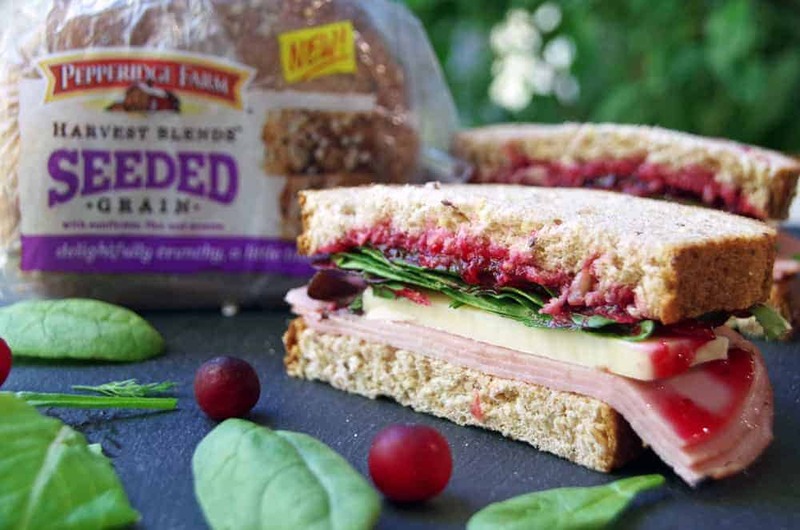 Pepperidge Farm Harvest Blend Bread looks like the perfect combo with your cranberry sauce sandwich. I love breads that are flavorful. I have a bunch of Thanksgiving meat sitting in my fridge! This would go perfectly with my leftovers! What a fun way to enjoy leftovers! I would have never thought of using cranberry sauce. This is such an brilliant idea! I wish I knew this last Thanksgiving, This is really awesome.